i. During his travel in Gujarat in connection with BJP's election campaign, Shri Narendra Modi accepted an air ride from Ahmedabad to Dharoyi and back on a sea-plane on 12-12-2017. The sea-plane was an aircraft (Kodiak 100) owned by a foreign company, namely, Utah-based Quest Aircraft Company, operated by a Japanese plane-maker. Apparently, the aircraft is also owned by the Bank of Utah with registration in the US. ii. The contents of the news report suggest that the Prime minister's aerial ride was intended to bypass the lack of police permission for a road show in Gujarat. It appears that the journey undertaken on the sea-plane became a part and parcel of the election campaign for BJP as it did have a visible impact on the people. The news report states that "BJP went a little overboard in highlighting Modi's last rally for Gujarat polls. 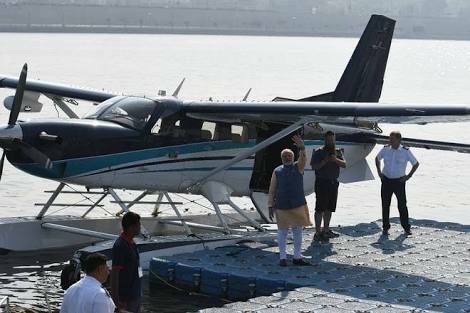 BJP's twitter handle posted 'Modi becomes first passenger of India’s first ever seaplane! '” This leads to the inescapable inference that the sea-plane ride was intended to be a part of the election campaign. iv. The news report estimates the cost of the sea-plane ride to be Rs 40 lakhs. Since an aircraft owned by a foreign company was involved, this amounts to an outright violation of the Foreign Contribution (Regulation) Act (FCRA). FCRA prohibits political parties from accepting donations, direct or indirect, from a foreign source. v. If either the Central government agencies or the State govt agencies have paid for the expenditure incurred on the sea-plane ride, the ECI should take cognizance of the same and take such action that is appropriate against all those responsible for diverting public funds for private electioneering.